While doing interviews on pit road, Erin Andrews bumps into rapper, 50 cent, who shares an awkward kissing moment. Andrews seems preoccupied as 50 goes in for a smooch. 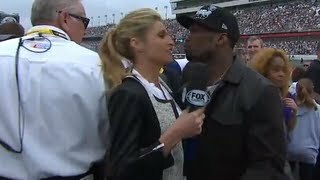 Erin Andrews and 50 Cent shared a kiss awkward moment at the Daytona 500 today. Whoo Kid's Untold 50 Cent Stories: Did Em Try To Assassinate 50? Erin Andrews -- Awkward 50 Cent Kiss Was My Fault!